Opera in three acts - originally called Violetta, the name of the main character - was composed by Giuseppe Verdi. The libretto, in Italian, was written by Francesco Maria Piave, and was based on the novel The Lady of the Camellias (1848), by Alexandre Dumas, fils. La Traviata, one of the most famous and widely performed operas in the world, was premiered in this very theatre, the Gran Teatro La Fenice, on 6 March 1853. The main parts were played by the soprano Francesca Lucci Donatelli and the tenor Ludovico Graziani. Although both Verdi and Piave wanted to set the action in a contemporary context (the mid 19th century), they had to adapt it 18th century Paris for various reasons, but in particular due to the censorship of the times. It would not be until the end of the 19th century that the opera was presented in accordance with the wishes of the composer and librettist. 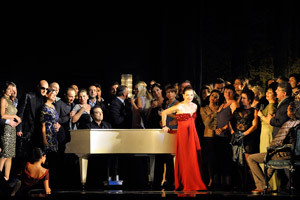 Although the premiere of La Traviata was a failure, it was performed again after some changes were made and consequently achieved huge success, which has lasted to the present day. Unlike other operas by Verdi, La Traviata is a realistic and intimate psychological drama. What is more, it was the first of his operas in which contemporary dress was used (dinner jackets and long dresses) instead of historical costumes from previous centuries (as in Rigoletto) or even from other civilisations (as in Aida). The action narrates the tragic love story of Violetta Valery and Alfredo Germont, and is set in Paris and the surrounding area around 1850.